I don’t quite remember the first time I had digestive biscuits. We often had different kinds of dipping biscuits with our tea in the morning. But most of them were slightly cardboard-y, often flavorless, and just kind of meh. Oh, I still had them, of course. But it wasn’t like I thoroughly enjoyed them. 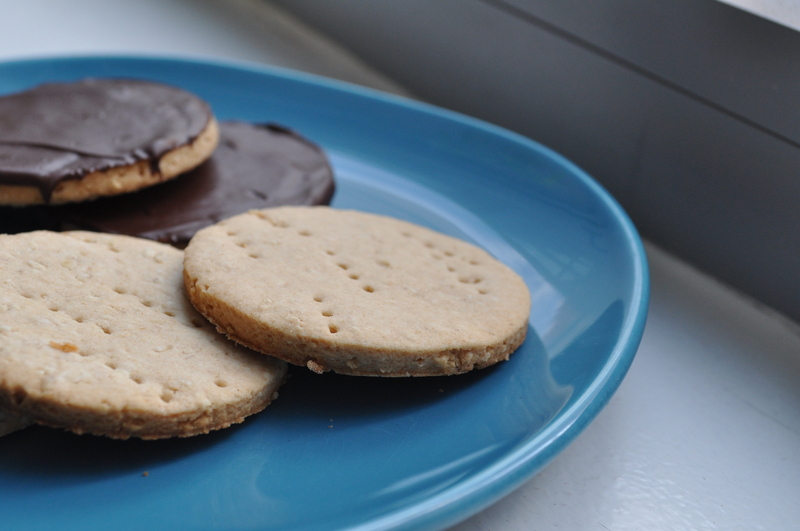 And then, at some point, digestives came into my life and my tea and biscuit experience completely changed. These were slightly sweetened biscuits that were light and crumbly, not dense and snappy. They held up to tea dipping, but they were also so delicious on their own. I would have them spread with Nutella, or dipped in cold milk, or warm milk, or just plain. And they’re not even called cookies, so you don’t feel bad having them at any time of day! Slowly I converted my entire family to digestive biscuits. 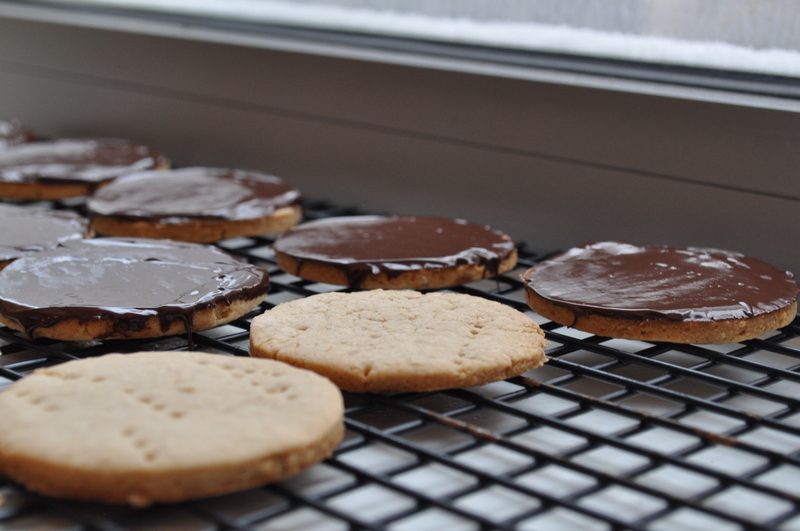 Slowly, I started using digestives in my baking. And slowly, the world became a happier place. So, here we are, with another attempt of making store–bought treats homemade. I’m not going to lie – these don’t take exactly like those that come in that enticing red sleeve. 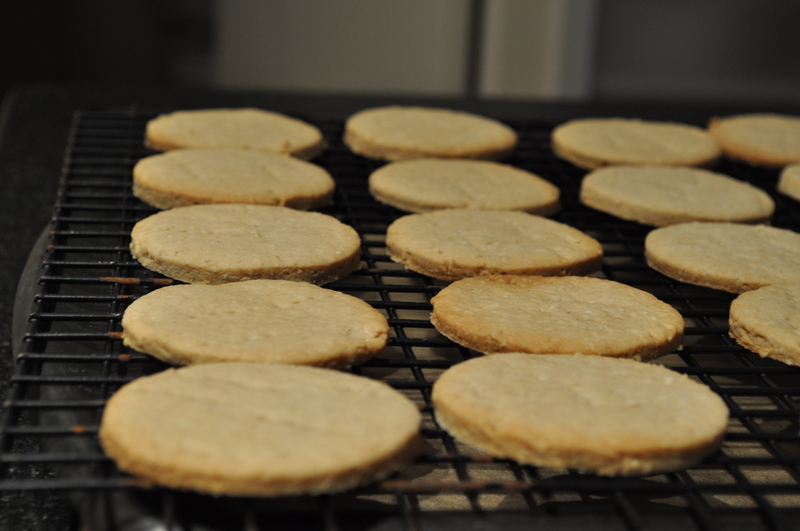 The texture is more of a shortbread cookie, rather than a crumbly biscuit. 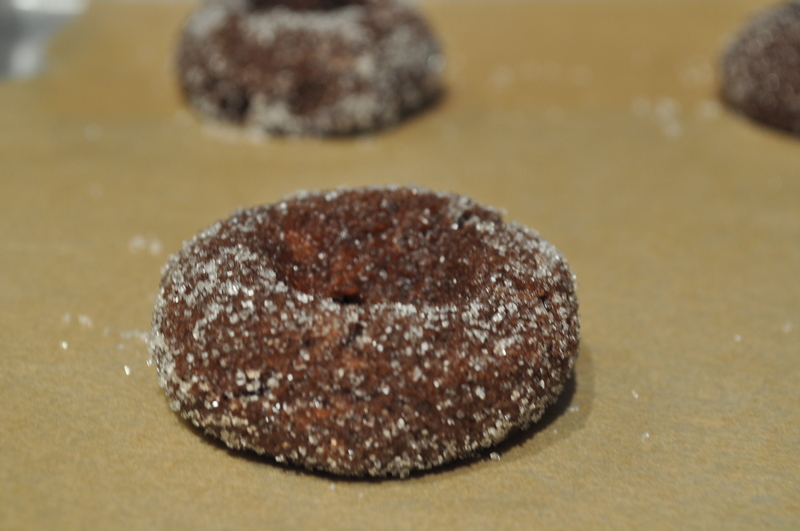 But they are still light and barely sweet, and these, too, hold up to tea dipping and Nutella spreading. And that’s all you need for a glorious tea biscuit. Place oats into a food processor and pulse until it becomes a fine powder. Add the flour, salt, baking powder and powdered sugar and pulse a few more times until the dry ingredients are well blended together. Add butter and let the food processor run until the butter becomes pea-sized and the mixture resembled coarse sand. Add the milk and pulse together until the dough comes together in a ball. Lightly flour a surface. Dump the dough out and press together until it is a disc. 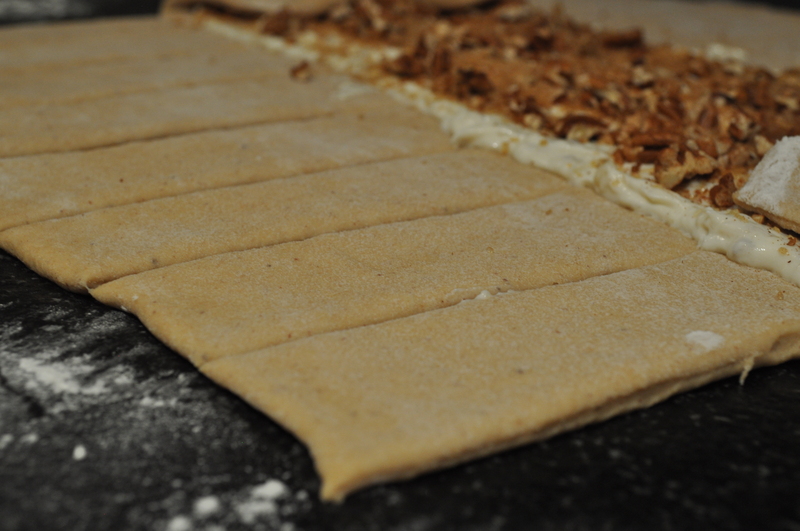 Roll out the dough until it is about 1/8 inch thick. Prick the entire surface with a fork. 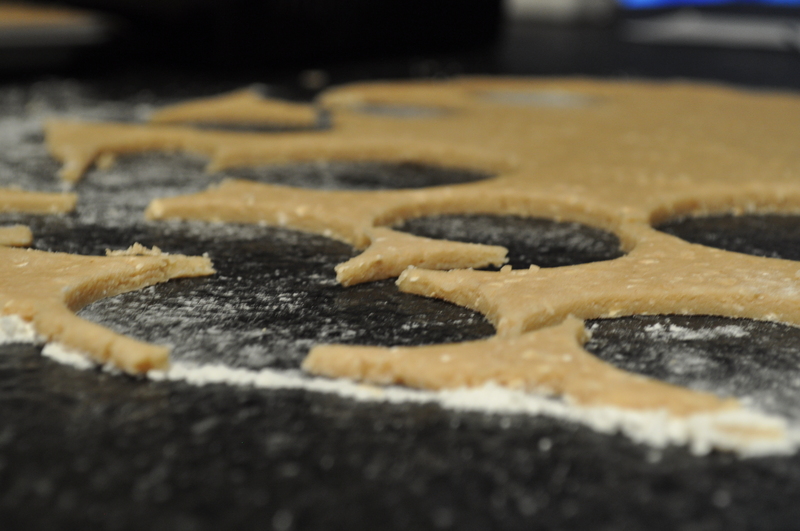 Using a biscuit cutter, cut out circles and place them on prepared baking sheets. Re-roll scraps and keep cutting until all of the dough has been used. Bake for 20 minutes, or until golden brown. Let cool on baking sheet for 5 minutes and then let cool completely on wire rack. If desired, melt the chocolate in the microwave in 30 second intervals, stirring after each interval. Dip the non-pricked side of the digestive into the chocolate, using a butter knife to help with even spreading. Place the digestive on the wire rack to let the chocolate cool completely. I spend a lot of my time looking at recipes. Not necessarily looking for recipes, but looking at recipes. You know, just to check things out, plan out a future dinner party, perhaps make a last minute dessert, and because I just really, really like to. Sigh, my life is not that sad, I promise. Because I spend so much time looking at recipes, I feel like I have a good grasp of everything that is out there. I know the recipes that are trending on all of the food blogs (pie in the form of other desserts were all the rage last year), I know the new ways people are approaching food (hello, cake pops! ), and I know that the classics are always well…classic. Well, there I was, on a Sunday night, doing my usual Sunday night activity, looking at food blogs, and poring through my cookbooks. I was looking for something specific this time: I had bought about 12 bananas that were really not ripe at all. But you know what happens with unripened bananas. They all turn black at the same time! Anyway, I digress. 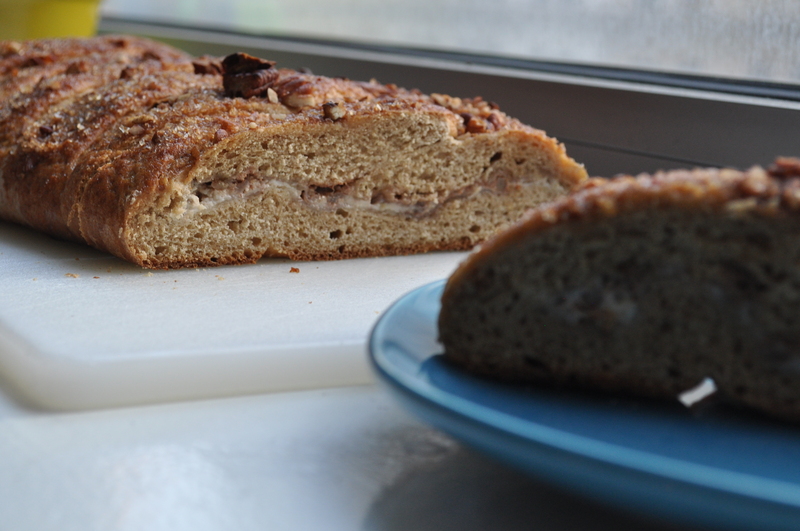 When I was doing my search, I came across a yeasted banana bread recipe! This was new! I had never seen anything like this before! And I was intrigued. 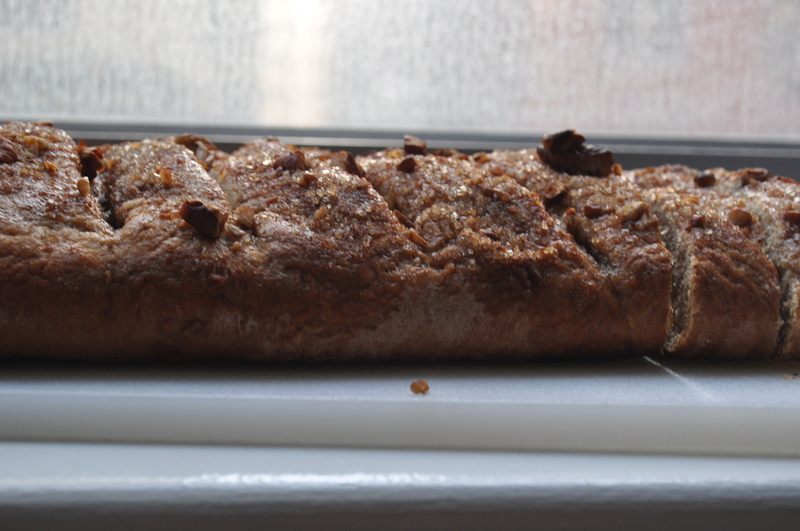 Even with my aversion (or my determination to overcome this aversion) to yeast, this may be my new go-to banana bread! First off, because it’s January and everyone has resolutions, unlike a regular quick banana bread, this bread has no butter or oil (!). It still uses 3 whole bananas that you may need to use quickly. And to top the whole thing off, it has this cream cheesy, streusel-y filling that makes it just indulgent enough. So delicious. It’s light and fluffy and just barely sweet and banana-y, and a totally new discovery with the same ingredients. A Sunday night winning discovery in anyone’s book, I’d say. In the bowl of your stand mixer, dissolve the sugar into your warm water. Sprinkle in the yeast, giving it a good mix. Allow the mixture to sit for 5-7 minutes, until it’s frothy and bubbly. With the paddle attachment, blend in salt, cinnamon, mashed bananas, egg, and vanilla and mix until everything is well incorporated (1-2 minutes). Switch to the dough hook to your stand mixer, and add the flour, about one cup at a time, mixing well until the dough comes together into a soft, slightly sticky ball of dough. Mix on low speed for about 3-4 minutes to knead. If the dough is not coming together into a ball, add more flour, one tablespoon at a time. 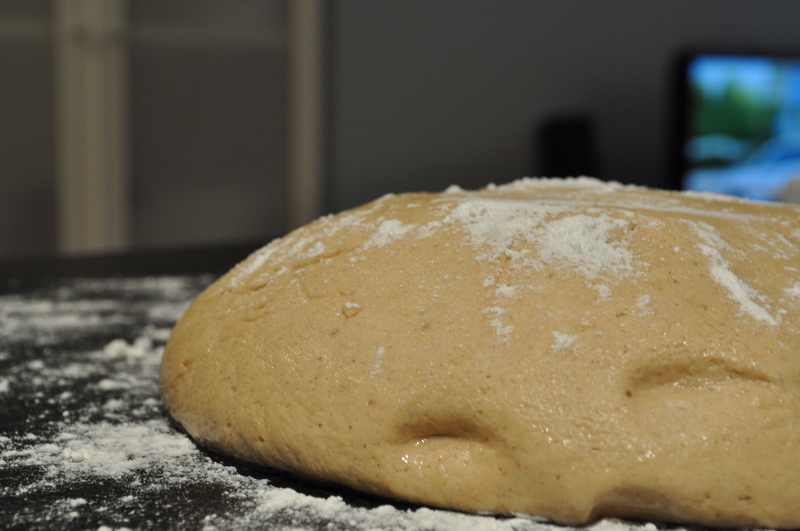 Turn the dough out to a lightly floured surface. Fold over 10-15 times, then place the dough in a lightly greased bowl, turning once to coat. Cover the bowl with plastic wrap and set in a warm place until doubled in size (about 45 minutes to 1 hour). In a bowl, stir together the sugar, pecans and cinnamon. In a separate small bowl, with a fork, mash together the softened cream cheese and bananas. Put both aside until dough has risen. Fold the top two flaps over the filling. With a pizza cutter, on one side of the bread, slice the dough down the middle until it reaches the filling. Cut each half in half, and again, so you have eight strips on one side. 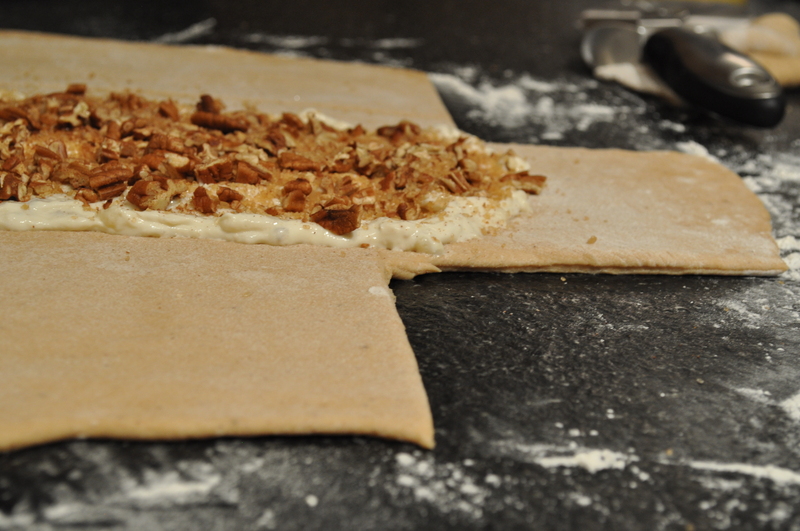 Repeat on the other side of the dough so the strips are even. Whisk together egg and milk for the egg wash. Brush on top of the entire surface of the bread. Sprinkle the bread with the remaining 1/3 of the sugar mixture. 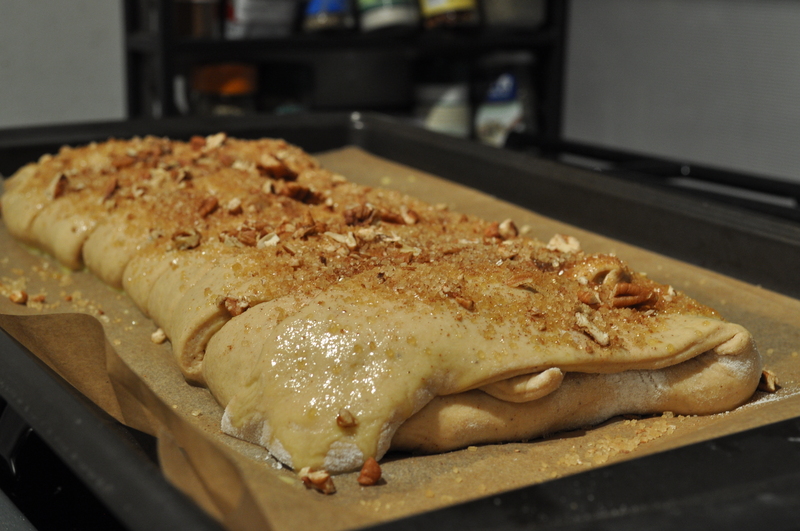 Cover bread loosely with plastic wrap and let it rise in a warm place for about 20 minutes. Preheat oven to 375. Bake bread for about 30 minutes until it reaches a deep golden brown. Let cool on baking sheet for 10 minutes and then transfer to a wire rack. 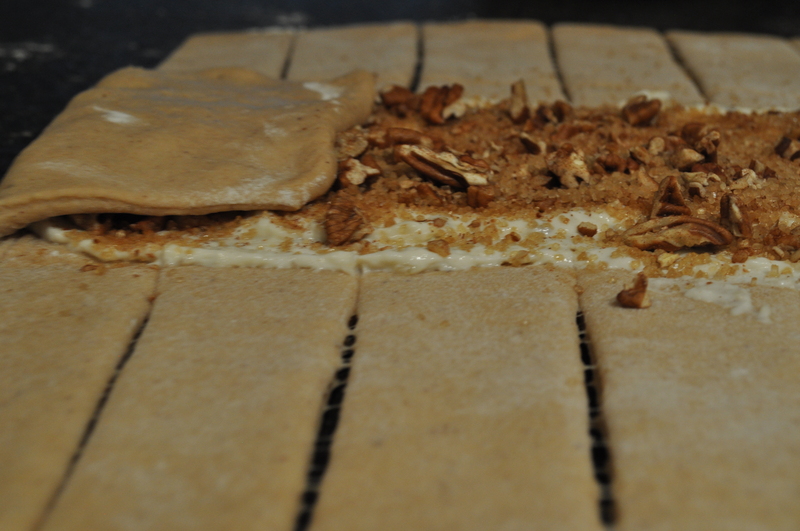 Let cool completely before cutting to make sure that the filling does not seep out. Happy new year, friends! Apologies for the silence. 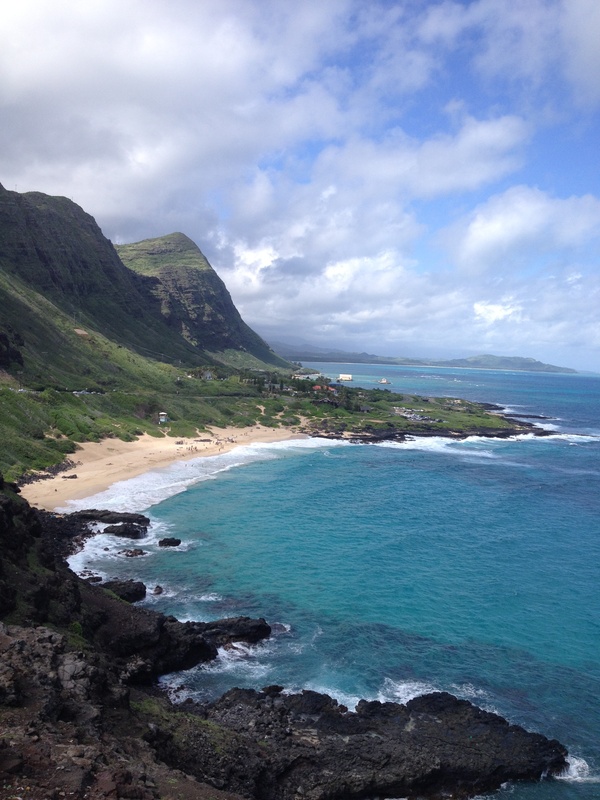 I spent my holidays, well, in Hawaii, where as much as I had intended to try new recipes and cook for my family and post frequently, I just did not. I did eat, though! I mean, in between visiting the beach, taking surfing lessons (failing at surfing lessons), and hiking up all of the mountains that surrounded us, I ate well. There were many things to try! 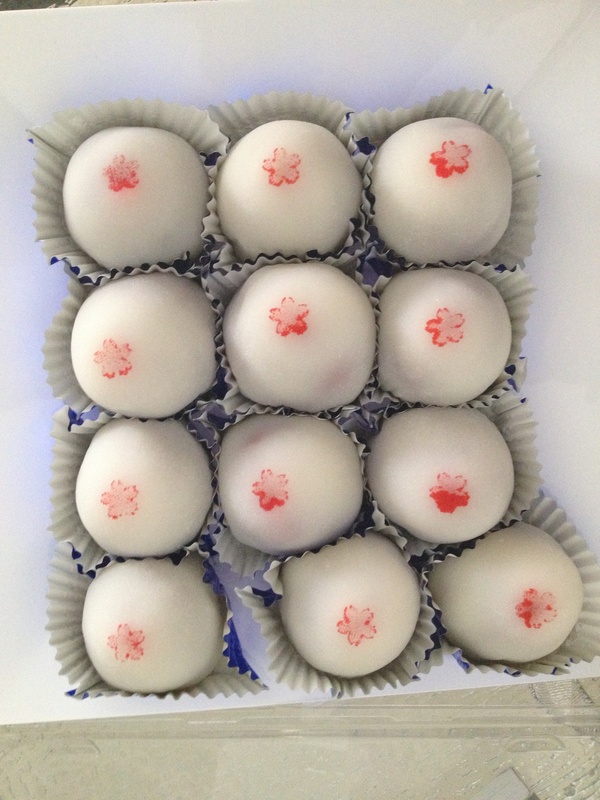 Fresh coconut mochi, mochi and adzuki bean covered strawberries (pictured above), mochi ice cream, mochi covered oreos. (They really like their mochi). 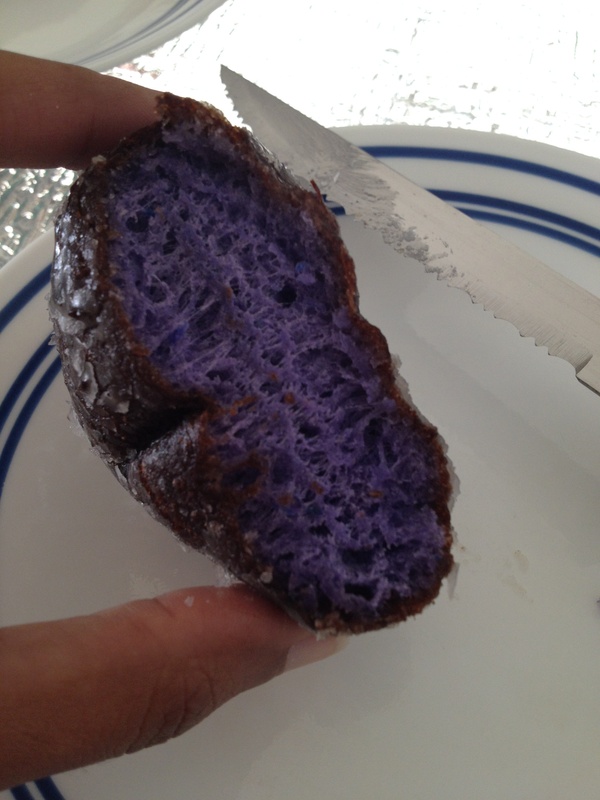 Taro doughnuts (pictured below), guava juice, shave ice drizzled with condensed milk, macadamia nut ice cream, wasabi flavored macadamia nuts, Kona coffee brittle, Portuguese doughnuts doused in cinnamon sugar, iced tea with coconut milk. I mean, let’s be honest, people. I ate a lot. I’m on a juice cleanse now. My favorite of all of these things, though, was passionfruit. They had passionfruit flavored everything, and it was just so so good. Fresh and bright, sweet and silky and tangy, this, my friends, is a satisfying flavor. And so, of course, I stocked up on all things passionfruit before heading back to the polar vortex. I now have an abundant supply of passion fruit mustard, passion fruit dressing, passion fruit butter, passion fruit jam (low sugar, of course), and passion fruit sugar (to make up for the jam). Yes. This may be the start of an addiction. So, to pay homage to my delicious trip (and to start using some of my products that I bought), I bring to you chocolate and passionfruit thumbprints. Cookies to get you through this ridiculous cold weather, but tropical enough to remind you that spring is just around the corner (or to tell you to book a trip to Hawaii). The truth is that these cookies were so addictive that I didn’t even get a picture of one that was fully assembled. So, make these (! ), and I’m leaving you with this picture of the beach instead. Aloha! I realize that passionfruit butter and sugar are not as readily available on the mainland, but no worries! You can still make this tropical – the most easy being replacing the fruit butter and sugar with lemon curd and lemon sugar. Just zest a lemon into sugar and mix it around and roll the cookie dough balls in there. In a medium mixing bowl, whisk the flour with the cocoa powder and salt. Set aside. In a microwave-safe bowl, melt the bittersweet and semi-sweet chocolates on low until just melted. Whisk well until smooth, then set aside to cool slightly. In the bowl of a stand mixer fitted with the paddle attachment (or using an electric mixer), beat the butter until light and creamy, about 2 minutes. Add the sugar and beat on medium until fluffy, another 2 minutes. Add the egg and vanilla and beat until just combined. Pour the melted and slightly cooled chocolate into the mixer and beat just until incorporated. Add the flour and cocoa into the mixer bowl in two rounds, beating at low speed in between each addition. Scrape the sides of the bowl as needed. Chill the dough in the refrigerator until firm enough to roll into balls, about 30 minutes. Meanwhile, preheat the oven to 350°F. Line 2 baking sheets with parchment paper. Spoon the passionfruit sugar into a small, shallow bowl. Scoop up roughly 2 tablespoons of the chilled dough and form into balls. Roll in the coarse sugar and transfer to the baking sheets. 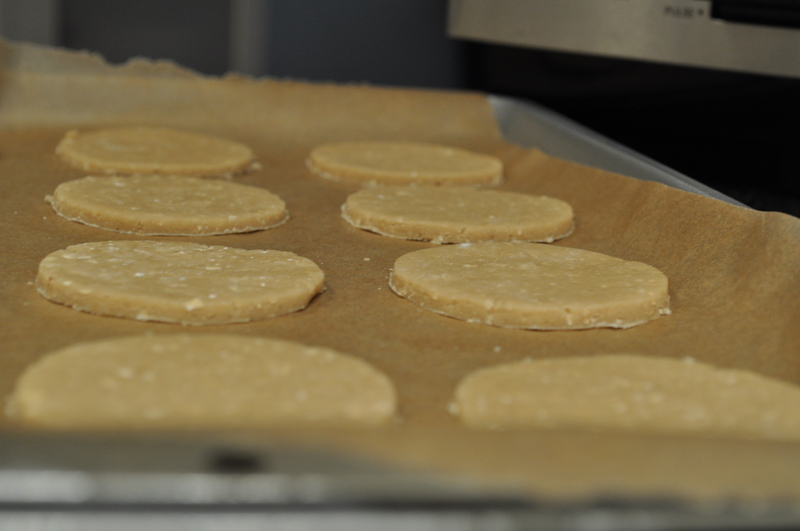 Using your thumb or index finger, press down firmly into the center of each cookie to form an indentation. Bake the cookies for 12 to 14 minutes, or until dry on top and slightly firm. Once out of the oven, press down gently on the indentations again to reinforce them, and transfer the cookie sheets to racks to cool completely. Fill each indentation with passionfruit curd.